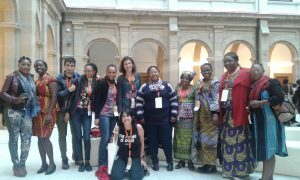 On the 18th and 19th of October, ALBOAN held at the University of Deusto the international convention “Women on the move: violence and displacement in 5 African regions”. More than 200 people attended an event, where the situation and demands of African women and children, who have suffered violence in situations refuge and displacement, were made visible. Also, the necessary measures to confront this reality were discussed, with the participation of well-known human rights activists and women’s rights activists such as Victoria Nyanjura, Justine Masika, director of the Congolese organisation Synergie des Femmes, and Caddy Adzuba, journalist and lawyer, as well as representatives from the world of University, public institutions and local and international humanitarian aid organisations. After the inauguration by Rector Jose María Guibert SJ, María Mar Magallón and Mateo Aguirre SJ, Director and Deputy Director of ALBOAN, respectively, the testimonies of women who’d been victims of violence resounded in the University’s auditorium. They were voices of suffering, but at the same time, voice of huge dignity and determination. The convention – organised by ALBOAN and the University of Deusto with the collaboration of the Jesuit Refugee Service and the Vedrunas sisters – is part of the Mieza programme developed by ALBOAN and made possible by a private endowment. As a first phase of this programme, over the course of the last year a diagnosis has been elaborated that gathers the testimonies of 152 women of 15 different nationalities, in 8 different countries: Morocco, Cameroon, the Democratic Republic of the Congo, Angola, South Africa, South Sudan, Ethiopia and Kenya. The sessions of the convention show that the necessary trinomial for female victims of violence is “accompaniment, justice and reparation”. In this sense, the lines of action that will mark the roadmap over the next five years in the work with these women and girls in Africa were identified.